Upper/material: Leather and technomicro. Lined: Lined with cambrelle and air teflon mesh. Sole: Srs sole ? 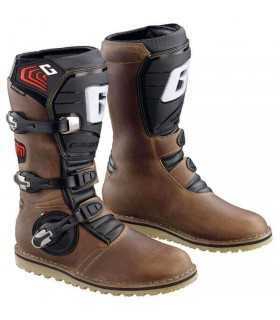 sole replaceable system, compatible with e1 sole (enduro sole) and with sms sole (for supermoto). Tecnology: Replaceable shin plate. Fully adjustable calf area. Toe area covered with a plastics reinforcement. Rigid, shock resistant, anatomically shaped heel. Micro adjustable and replaceable buckle system. Dual flex system upper. New adjustable system of the area between the protective calf-exaust and the front of the boot to allow a rider with a wider calf to be very comfortable. Replaceable metatarsus inserts. Assembled and replaceable boot leg, it is stitch-free.